DONEGAL, IRELAND — Above is an image of Donegal Bay at sunset. It is striking with its still water, wheeling gulls and glacially-rounded rocky islands. I am in County Donegal for a couple of days simply to see the place and get some hints of what is said to be the most complex geology in Ireland. There is also some evidence that the Wilson part of my family comes from the northwest of Ireland, so I might be seeing a bit of ancestral homeland. I am staying in the town of Donegal in the south of the county and will be visiting sites in the north and west tomorrow. Today, after a very bumpy flight and landing (Donegal airport is known for its high winds), I am exploring the town and its surroundings. 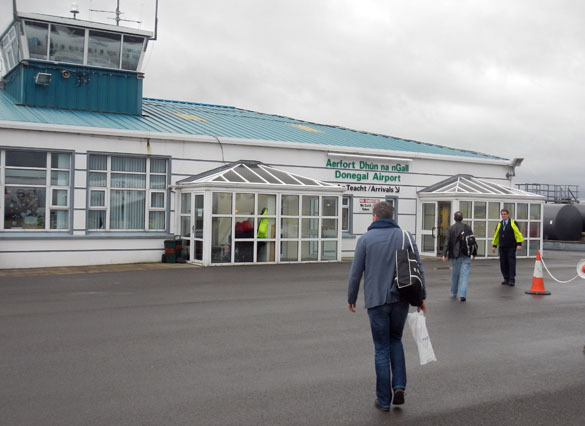 This is the little County Donegal airport in the north. It is in one of the most isolated spots in the county — no bus line goes to it and taxis have to be ordered in advance from nearby towns. There were seven people on the plane, including the crew. 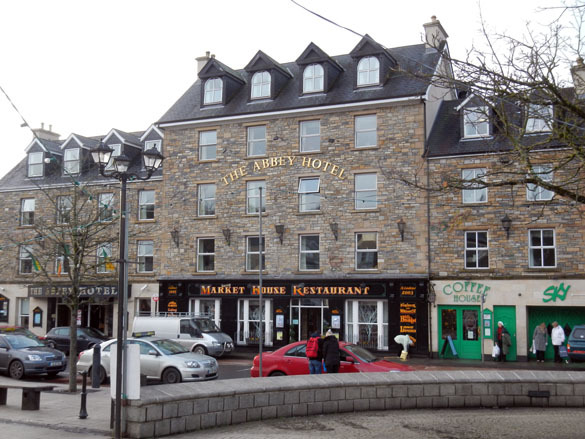 The Abbey Hotel in downtown Donegal. My home for a couple of days. 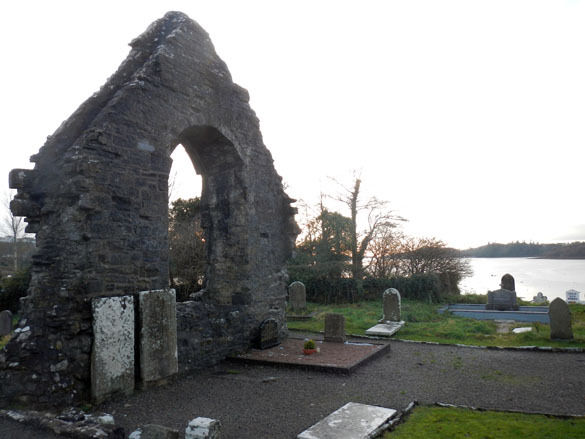 The ruins of the Franciscan Abbey in Donegal along the southern shore of the bay. It was built in 1474. 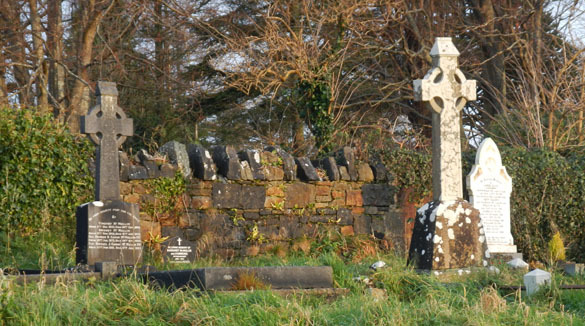 As with many such structures in Ireland, it has a long history of sieges and intrigue. This portion has been used as a graveyard for centuries. The geology just along the shores of Donegal Bay seems complicated enough. There are some rocky outcrops I could not reach, along with exposures of boulder-studded glacial drift such as here. The stones used in the local walls and in the remaining Abbey structures are diverse. Most are dark gray metabasalts or amphibolites, as seen in this graveyard wall lit by the setting sun. 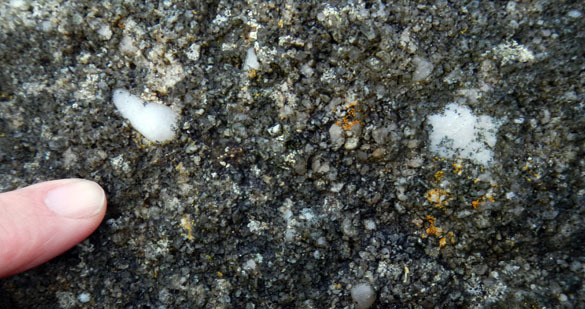 One prominent stone in the Abbey walls appears to be a quartzite metaconglomerate. Both these rock types are derived from local pre-Paleozoic outcrops. 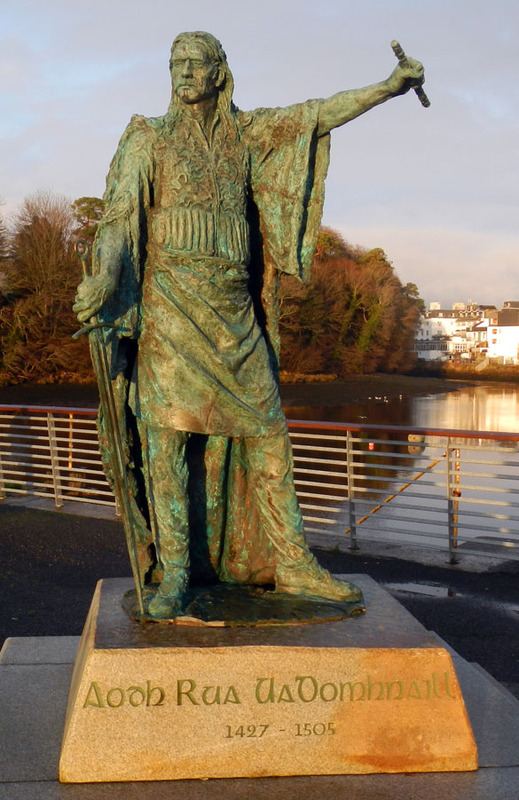 Finally, here is a dramatically-lit statue of Aodh Ruadh Ó Domhnaill (1427-1505) at the head of Donegal Bay and mouth of the River Eske. He was the subject of one of my favorite book-movie combinations as a kid: The Fighting Prince of Donegal. I also think he looks a lot like me, wouldn’t you say?